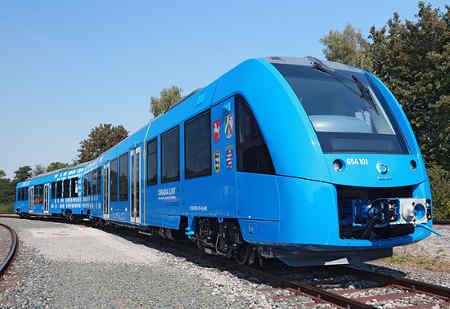 Germany debuts zero-emissions train that releases only steam, being powered by hydrogen. The train will open to the public in December 2017, and testing will continue before that time. The iLink can travel almost 800km (500 miles) per day up to 87mph (140 km/h) using lithium ion batteries (carrying 300 passengers). Batteries are powered by a hydrogen fuel tank on the roof of the train, which is similar to any other electric train, but does not need any catenary or pantograph. The main downside at the moment is that the production of "cheap" hydrogen usually involves the use of fossil fuels such as oil, although there are other more or less efficient and costly methods.